A Turkish Airlines flight TK2004 from Istanbul to Nevsehir has suffered huge damage from a bird strike during landing at the destination. Most of the damage to the Boeing 737-800 was done in the nose cone and the wings. AirLive web portal has obtained impressive photos of the plane from the scene. 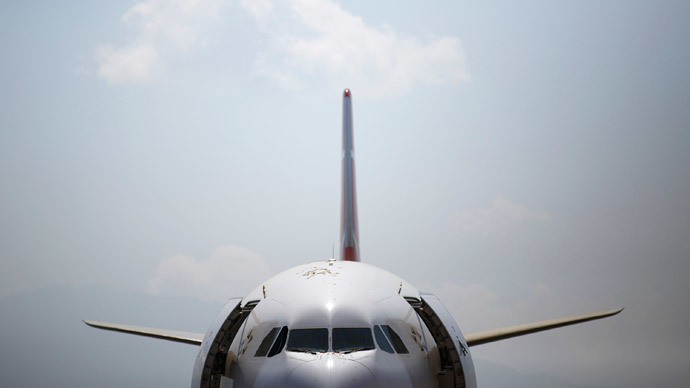 The incident comes almost two weeks after another Turkish airlines passenger jet, from Milan to Istanbul, made an emergency landing at Ataturk Airport. It was ablaze, as the right engine caught fire. Amid other incidents that the Turkish air carrier went through this year, is an emergency landing in March after a note with the word “bomb” on it was discovered in one of the plane’s toilets. At the beginning of March, Turkish Airlines Airbus A330 skidded off the runway in Nepal, crash-landing nose down in a grassy field.